Many ocean-based renewable energy technologies contain fluids used to maintain the rotors and turbines or to generate energy through a closed liquid system. Wave, tidal, and current systems often use turbines that are turned by the kinetic energy of the water, and oil or other lubricants are used to maintain the efficiency of the system, and the amount and type of fluid varies between systems (Hofford). Leaking of this fluid can cause plumage fouling on seabirds, as well as severely affect the chemical stress signal-detecting ability of fish (Boehlert and Gill). Most fish species relay on olfactory sensors along the side of their bodies to activate their alarm system in the presence of a predator. 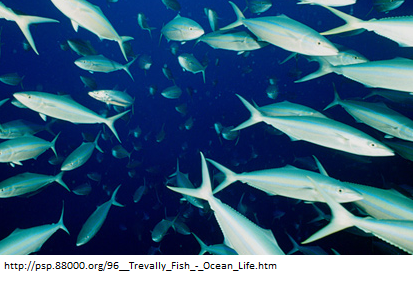 Chemicals leaked into ocean water can limit a fish’s ability to escape predators by blocking this system (Brown). 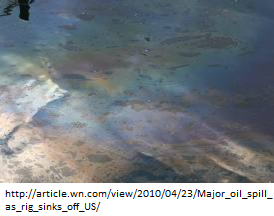 In addition, closed Ocean Thermal Energy Conversion (OTEC) systems make use of a working fluid that is heated and cooled, often ammonia that could leak into the environment, and can be very toxic to wildlife (Boehlert and Gill). These effects can be mitigated by using ocean water or biodegradable liquids in place of toxic fluids. Also, chemicals released into the ocean from both the renewable energy system and other sources can become stored in the sediment around the structure that could be disturbed and released into the environment during construction and decommissioning (Hoff0rd).